Kelsey Rae Barthel’s Beyond the Code features Aurora, known to a few as Luna. As her alter ego Luna, she is a skilled knight and utterly devoted to her master, Cole. During an attempt to expose and ultimately destroy Damon Lexus, a master of ill repute, Luna and Cole find themselves facing the battle of their lives. When the inconceivable happens during a confrontation with Damon’s assassin, Luna makes it her mission to avenge her master’s death and finally bring an end to Damon’s madness. The hunter quickly becomes the hunted when Luna is stalked, threatened, and subsequently saved by the very man sent to kill her. One of the most striking aspects of Barthel’s plotline is the attention to detail during the numerous action sequences. Beyond the Code is an urban tale of knights, masters, and fascinating skills and features intense and well-drawn scenes filled with sword battles and otherworldly abilities. Readers desiring action will not be disappointed with the frequency of the battle scenes as they permeate the reading. Ranger’s appearance in the plot was a welcome one. 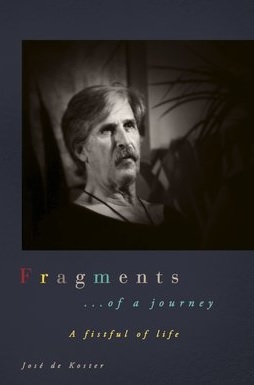 I tend to find some of the more benign moments in fantasies to be the most compelling. For instance, I am sure most readers will find Luna’s heartbreak over Cole to be the most poignant part of the story line, but I see Ranger’s change of heart as the turning point of the book and the most gripping element of the plot involving him and Luna. I felt a much deeper connection between Luna and Ranger than I did between any others. The scene in which Ranger is unable to make himself fulfill his mission to destroy Luna is a touching one in which the author allows the reader a thorough glimpse inside Ranger’s mind. The fact that he questions Luna’s reactions and the intensity of her emotions is moving. As he gives in to his own questions, the reader is offered a much different side of Ranger. The haunting of Luna by Venom, the assassin she kills, and the flashbacks Luna endures are heart-wrenching. These are some of the most poignant scenes in the entire book and are much of the reason I continued to remain attached to Luna’s character and her ongoing trauma. I was not as compelled by the lengthy battle scenes as I was the deep and moving exchanges between Luna and Ranger. The toggling between identifying Aurora as Luna did seem to get in the way of my reading just a bit in the first chapters. I found myself rereading in order to make sure I had, indeed, read correctly. Her hidden identity plays a major role in the plot, but does tend to interfere at times with the flow of the text. 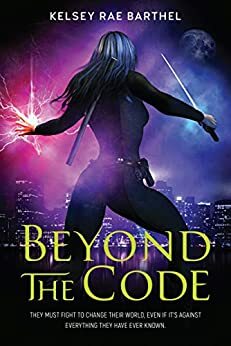 Beyond the Code by Kelsey Rae Barthel is brimming with action and focused upon characters who are hellbent on keeping themselves on the right side of things, this piece is sure to appeal to fans of urban fantasies. Posted on April 13, 2018, in Book Reviews, Four Stars and tagged action, adventure, alibris, author, author life, authors, barnes and noble, battle, beyond the code, book, book club, book geek, book lover, bookaholic, bookbaby, bookblogger, bookbub, bookhaul, bookhub, bookish, bookreads, books of instagram, booksbooksbooks, bookshelf, bookstagram, bookstagramer, bookwitty, bookworks, bookworm, coming of age, ebook, fantasy, fiction, goodreads, hunt, ilovebooks, indiebooks, kelsey rae barthel, kindle, kobo, literature, nook, novel, publishing, read, reader, reading, shelfari, smashwords, story, sword, urban fantasy, venom, war, writer, writer community, writing. Bookmark the permalink. Leave a comment.